We tend to associate skydiving with jumping out of a plane, but that’s not how it started. Long before the invention of the modern parachute, skydiving was being practiced in ancient China. Using naturally high land formations these brave or suicidal individuals would jump off the highest precipices and drift slowly to earth using hand crafted parachute/kite contraptions. In fact, Leonardo da Vinci himself was known to have designed a pyramid shaped parachute though no one knows if it was actually built and tested. What we consider as skydiving developed after Andre Jacques Garnerin made his first successful jump with a parachute from a hot air balloon back in 1797. After this the military developed a parachute exit technique to save aircrews during mid air emergencies, first in balloons, then airships and finally planes, before further developing it for delivering troops to the battlefield. The first skydiving competitions started in the 1930’s before it finally became an internationally recognised sport in 1952. Skydiving is now about more than just jumping and landing safely, the sport has developed different disciplines in which participants can take part, with the focus being very much on fun and recreation. Tracking: Also referred to as free-flying. The jumper will assume a body shape that will allow them to accelerate and cover as much ground as possible. Cross Country: This type of jump dictates that the parachute be opened as soon as possible after jumping to allow for the maximum amount of ground to be covered during the fall, jumpers can end up landing miles away from the initial jump site. Pond Swooping: This jump is purely for competition purposes and involves the jumper trying to perform a successful landing after skimming or gliding across the surface of a small body of water before landing safely on the other side. Points are deducted for jumpers who don’t make the landing and end up sinking in the water like a stone. Stuff Jumps: Stuff jumps involve the use of props and take place from aircraft with large rear doors. One important pre-requisite is that stuff jumps take place over unpopulated areas. Props can be anything from inflatable rafts to cars. 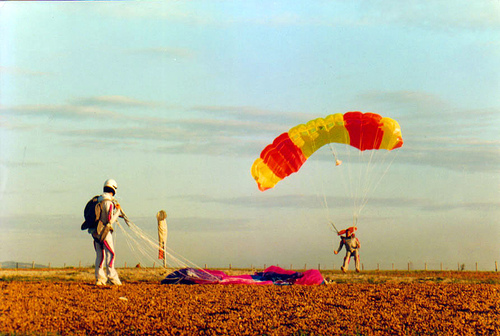 The jumper completes the first part of the jump with the object of choice, before breaking away from it at a certain height and opening their parachute, the object is left to fall and smash down into the ground. Night Jumps: Jumps do not always have to take place during the day, though night jumps should only be performed by experienced skydivers. Specialist equipment is required such as a lit altimeter, in association with an audible altimeter. Night jumpers should also carry a flashlight with them to ensure that the parachutes have opened correctly. Altitude and distance from the ground can be very hard to gauge at night, so much so that the ground can just seem to appear without warning and take a jumper by surprise. 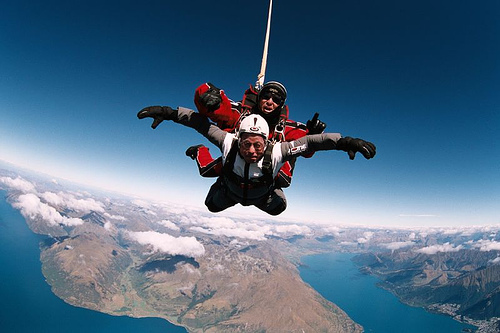 This entry was posted in Air Sports, Sky Diving and tagged History, Sky Diving, Skydiving. Bookmark the permalink.